Over the past few years, the D.C area has been experiencing mild and uneventful winter seasons; however, this does not mean it's impossible to find good skiing within a short two or three hour drive. Most of the surrounding ski resorts are located in Maryland and Pennsylvania, which might sound daunting at first, but in reality they are closer than you think. My personal favorite slope for a quick day trip is Whitetail Resort in Mercersburg, PA. Whitetail is located just two hours away from D.C and the drive features scenic views which keeps your passengers occupied and pleased. Whitetail ranks above the surrounding resorts for me because of the amount and difficulty of the trails; Whitetail incorporates a trail for every kind of skier/boarder, beginner to expert. The snow you usually find at Whitetail, and most other resorts around D.C, is often produced from a multitude of snowmakers the mountain possesses. Although the snow doesn't compare with the fluffy powder found out west, it gets the job done. When you are ready to take a break from the slope, Whitetail offers a few different restaurants and cafes you can visit to satisfy your hunger or just hangout. If you are interested in more than a day trip, Whitetail offers lodge-like houses, and cozy apartments available for rent. 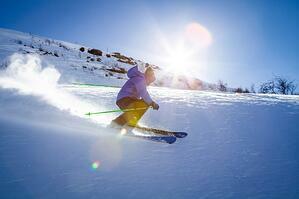 The other resorts located close to the DC area include Liberty Mountain and Roundtop Mountain. Whitetail, Liberty and Roundtop are owned by the same company. The single ownership is attractive because the majority of deals and season passes are interchangeable at each of the three resorts. If you seek better conditions than the local resorts and don't mind spending an extra hour in the car, I check out Wisp Resort or Seven Springs Resort. Wisp and Seven Springs offer much more in terms of snow and shear mountain size; however, the drive to these resorts is closer to three and a half hours from D.C.
My name is John Ott and I am currently an intern with Glass House Real Estate. I have been an Arlingtonian for most of my life and I plan on moving back to the area post graduation. I am attending Hampden-Sydney College and I am majoring in Business and Economics. While at school, I am a volunteer firefighter and I enjoy spending time outdoors. Through my studies, I have developed an interest in real estate and home building.